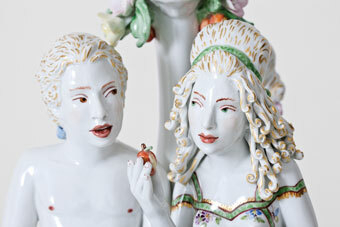 Chris Antemann in collaboration with Meissen®, Tempted to Taste (detail), 2013. © Chris Antemann and Meissen Couture®. 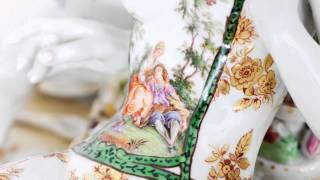 Chris Antemann in collaboration with Meissen®, Covet, 2013. © Chris Antemann and Meissen Couture®. In 2012, Oregon-based sculptor Chris Antemann was invited to participate in the Art Studio program of the renowned Meissen Porcelain Manufactory to collaborate with the Meissen master artisans on unique pieces and a series of limited editions of her sculptures, resulting in a grand installation that reinvents and invigorates the great porcelain figurative tradition. Using the Garden of Eden as her metaphor, the artist created a contemporary celebration of the 18th-century banqueting craze. Inspired by Meissen’s great historical model of Johann Joachim Kändler’s monumental Love Temple (1750), Antemann created her own 5-foot version. Stripping the original design back to its basic forms, she added her own figures, ornamentation, and flowers, as well as a special finial with three musicians to herald the guests to the banquet below. Employing her signature wit and formal references to classic Baroque Meissen figurines, Antemann has invented a new narrative on contemporary morality through her one-of-a-kind porcelain figures in a setting that evokes the decadence of Boucher and Watteau. Antemann’s Love Temple is the centerpiece and heart of the installation. It was designed to house a host of semi-clothed revelers around a banquet of “forbidden fruit.” After sculpting the Love Temple and banquet table, Antemann expanded the vision of the installation to include a pleasure garden made up of eight separate pieces that surrounds the temple, creating an elaborate tableau in the great tradition of royal 18th-century sur la table. Accompanying the lavish and overflowing banquet table is a massive 12-light porcelain chandelier and a collection of smaller sculptures to accompany the table along the gallery walls, evoking the tradition of palatial porcelain rooms. The small, intimate vignettes entertain with playful scenes of dalliance and seduction. Don’t miss this irreverent look at history and the decorative arts tradition in this brilliant porcelain sculpture. The exhibition is sponsored in part by a generous gift by Arlene Schnitzer, the Paul G. Allen Family Foundation, and the Exhibition Series Sponsors.